Make your kitchen the heart of your home with Dream Doors South East London. Speak to our designers and view our stunning collection at your local kitchen showroom. 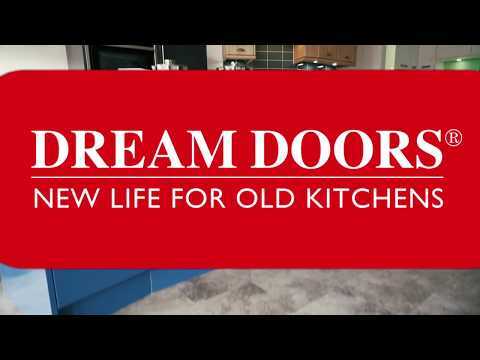 Dream Doors South East London is your one stop shop for kitchens. Why not visit your local showroom to discuss your ideas with owner Clive and get a feel for our products? At Dream Doors, we supply a whole spectrum of services, from simple door swaps right through to the design and installation of new kitchens. The best place to view our products and designs is your local showroom in Eltham, where business owner Clive can run you through the options available for your kitchen. As all our designs are bespoke, there’s no need to worry about awkward angles or difficult corners – we will find the best way to make the chosen design work in your kitchen. Our highly personalised service is overseen by business owner Clive, so you can have total confidence that you will be kept informed throughout the process and satisfied with the end results. We appreciate that designing a new kitchen can be quite daunting. This is why, as well as inviting customers to visit our showrooms to speak with our design experts and get a feel for the quality of our kitchens, we can also visit you at home. Book an appointment with Clive, who will measure up your kitchen space and provide a free quote, based on your style preferences, with absolutely no obligation to buy. Here at Dream Doors, we strive for what is best for our clients. We will endeavour to create your perfect kitchen, tirelessly tailoring it to your specific tastes and needs. From the initial quotation to the last minute of installation, we’ll deal with everything. Simply sit back, put your feet up and have a nice cuppa whilst we do the work. Dream Doors South East London offer replacement kitchen doors and fully fitted kitchens to all SE London postcode areas, including Bankside, South Bank, Lambeth, Southwark, Bermondsey, Vauxhall, Old Kent Road, Abbey Wood, West Heath, Crossness, Thamesmead, Plumstead, Blackheath, Kidbrooke, Westcombe Park, Brockley, Crofton Park, Camberwell, Denmark Hill, Peckham, Brixton, Catford, Bellingham, Hither Green, Charlton, Deptford, Evelyn, Rotherhithe, Eltham, Mottingham, New Eltham, Well Hall, Avery Hill, Falconwood, Sidcup, Chinbrook, Longlands, Kidbrooke, Shooter's Hill, Greenwich, Maze Hill, Greenwich Peninsula, Kennington, Lambeth, Vauxhall, Oval, Lee, Mottingham, Grove Park, Chinbrook, Hither Green, Eltham, Horn Park, Blackheath, Lewisham, Hither Green, Ladywell, New Cross, Peckham, Nunhead, South Bermondsey, Old Kent Road, Rotherhithe, Surrey Quays, South Bermondsey, Walworth, Kennington, Newington, Woolwich, Royal Arsenal, Plumstead, Shooter's Hill, Upper Norwood, Crystal Palace, Anerley, Crystal Palace, Penge, Beckenham, Dulwich, Dulwich Village, West Dulwich, East Dulwich, Peckham Rye, Loughborough Junction, Herne Hill, Forest Hill, Honor Oak, Crofton Park, South Norwood, Selhurst, Thornton Heath, Woodside, Sydenham, West Norwood, Gipsy Hill and Thamesmead. "The workmanship is excellent. - good time keeping." "Very good job, I will be using them again later in the year." "They were very accommodating and polite." "Clive and his team provided exemplary service. The doors, handles and workmanship are of a very high standard and we are delighted with our new kitchen." "Full explanations and high quality workmanship. Nice quality doors and drawers." "First rate service and workmanship at every stage."